An additional way to incorporate high force movements is to hit the weight room. For a long time it was taboo to lift weights as an endurance athlete. People often associated muscle mass as extra bulk being carried for the race distance. However, the plethora of research1,2 available shows that muscle mass is a useable component that should be accessed. Fat mass is storage, muscle mass performs the work. With this in mind, an obvious way to add more muscle mass is through strength training. Strength training further improves aerobic and anaerobic capacity by the addition of more glycolytic and oxidative enzymes. The addition of more of these enzymes means that our metabolism works more efficiently while at higher workloads. Being able to metabolize better means that we have greater means of using our energy stores as well as larger energy stores. Put simply, strength training leads to more energy available during endurance exercise. Strength training also enhances running economy. These improvements occur in a fairly simple fashion. Difficulty in force application all comes down to the amount of force being generated versus the maximum force capability of the muscle. For example, if your legs can generate 5000 Newtons worth of force in a maximum effort, generating 500 Newtons will be perceived as a very simple task and thus not require much energy. This scenario incorporates only 10 percent of the max effort (500N/5000N). The inverse is also true, if max effort generates only 1500, than we would be looking at 33 percent (500N/1500N). The lower the percentage, the better our economy. Swimming, biking, and running at a lower percentage allows us to increase intensity. This often occurs through increasing speed. Through improving economy, speed increases3. The best way to improve strength is to ditch the isolation exercises and incorporate large multi-joint movements. These movements include the bench press, squat, row, deadlift, and any variation of these. One aspect that is often overlooked in endurance training is how power plays into stride mechanics. Stride length is often determined by leg length and the amount of power output being generated through triple extension. We cannot do much about the length of our legs but we can control the amount of power generated by them. Increasing power output leads to increases in stride length. If stride length is increased and the number of foot strikes per minute remains the same, the result is higher speeds. Often, we overlook the need for stride length because of the importance of cadence. If we can maintain optimal stride length while maximizing cadence, race times will see a dramatic improvement. Power training has similar effects as strength training in how economy and anaerobic enzyme levels are changed. To incorporate power training, a simple yet very effective method is through plyometric exercises. 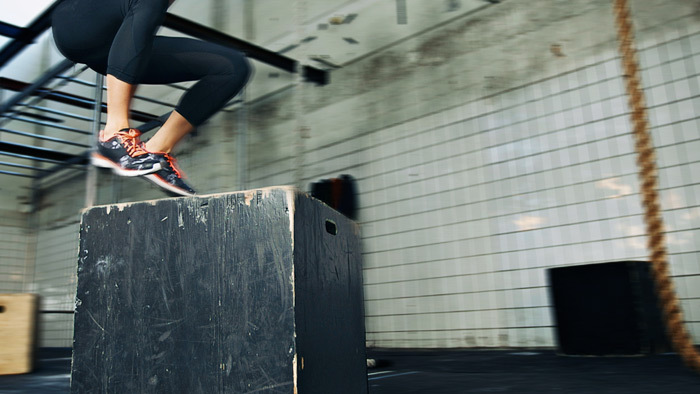 A classic plyometric exercise that requires very little equipment is the jump. Jumping on a box, over a hurdle, or even just performing a jump tuck leads to neuromuscular adaptations that can take performance to the next level. Additionally, joint and muscle balance is key to preventing soft tissue injuries such as muscle tears and strains as well as reducing the likelihood of injuries to connective tissue. Improved ligament and tendon strength results in improved joint integrity. The forces exerted on the joints during strength training puts stress on connective tissue causing increased bone formation. The end result is improved strength and resistance to injury. Lastly, strength training can serve as a great supplement to endurance training in its effects on resting metabolic rate (RMR). Resting metabolic rate is the amount of calories burned when doing nothing. This baseline is the bare minimum needed to maintain the human body. If an individual possesses more muscle mass, more calories are burned for body maintenance. At rest, a muscular body will burn more calories than one that does not have much muscle. More muscle means better body composition through increases in lean body mass and gradual reduction of fat mass. Incorporating strength and power work will set you up for a successful season ahead. Not to mention, it will give you a fresh new focus during the off season.